Of all that happened during one of the more amazing Sundays in Seahawks history — a team-record 452 passing yards by Russell Wilson, four lead changes in the final 9:09, Wilson’s 23rd fourth-quarter or overtime comeback victory in 99 career games — maybe the most jaw-dropping moment occurred afterward when Richard Sherman met the media. And when did anyone ever figure any Seattle defender would say that about the Seahawks’ offense this season? It was only a few weeks ago when some wondered if the Seattle defense might launch into a full-fledged rebellion at some point over having to carry the offense week after week after week. But on this day, when a defense that came in giving up the fewest points in the NFL allowed precocious Houston rookie Deshaun Watson to throw for 402 yards and four touchdowns, allowed DeAndre Hopkins 224 receiving yards — the second-most of any Seattle opponent in team history — and also allowed the Texans five drives of 71 yards or longer, it was the oft-maligned Seattle offense that did the heavy lifting. It was a day when every time the defense faltered — “It was not one of our better games in the history of us being here,’’ Sherman said frankly — the offense responded in a way few might have imagined it could. The last time came when the Seahawks (5-2) took over at their own 20 with 1:39 left, no timeouts, trailing 38-34 after the only time all day that the defense had bailed out the offense. On the previous possession Wilson — who was 26-41 on the day — made his only real mistake, trying to force a pass into single coverage to Richardson that was intercepted by Houston cornerback Marcus Williams at the Houston 8 with 2:49 left (the same player Wilson had just stiff-armed at the end of a 21-yard run). While the Texans rightly celebrated the play wildly, Seattle got another chance when after allowing one quick first down the Seahawks then forced a punt that Tyler Lockett returned from his own 9 to the 20. As he entered the huddle, Wilson said his message was a simple one. And then they did, Wilson first going right back to loft another jump ball to Richardson who was locked in man coverage with Marcus Gilchrist. And as he did last week for a touchdown in New York, Richardson won the jump and then the fight for the ball and a 48-yard gain. It was an epic quarterback battle Sunday. A look at how Seattle’s Russell Wilson fared against Houston’s Deshaun Watson. Next came an 18-yard pass to Lockett, whose most critical move — with the clock running — might have been to smartly run the ball to the middle of the field after the play was over so the Seahawks could get the next snap off as quickly as possible. Then, on a play that snapped with 26 seconds remaining, Wilson threw to an inexplicably all-by-himself Jimmy Graham for the easiest touchdown on a day when there were a combined 10. 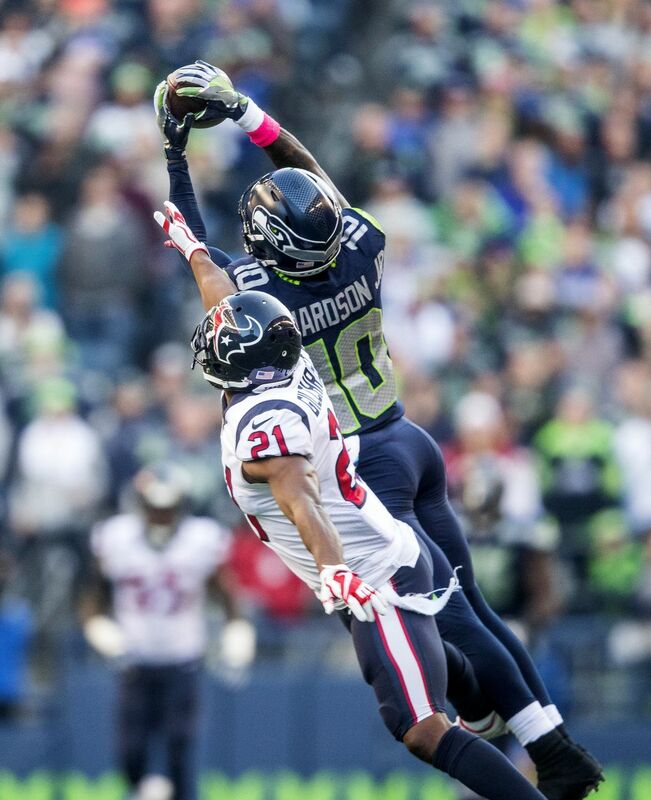 Graham’s TD, which officially came with 21 seconds, sewed up Seattle’s fourth straight win. 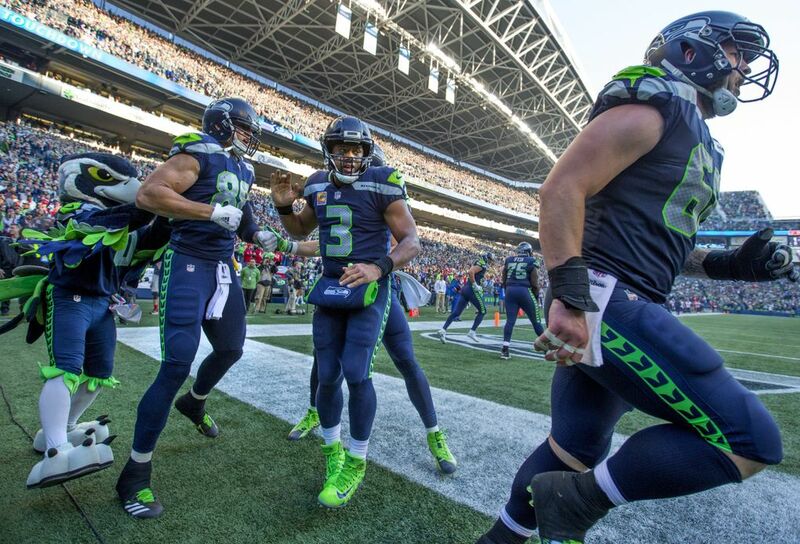 The scoring play not only gave Wilson his seventh touchdown pass in his past six quarters, and four for the game, but also allowed him to surpass Seattle’s previous game passing record of 449 by Matt Hasselbeck in an overtime game at San Diego on Dec. 29, 2002. “That was just really fun,’’ said an equally ecstatic and exhausted Carroll. Even if it was so completely unlike the Carroll-era Seahawks. Seattle won despite rushing for just 33 yards on 21 carries — 30 on four by Wilson — with the tailbacks managing just 5 yards on 15 attempts. Carroll acknowledged that the Seahawks — who from 2012-15 were among the top four in the NFL in rushing every year — eventually just abandoned any pretense of being able to run. Instead, Wilson completed four passes of at least 48 yards or longer, with Lockett finishing with 121 yards receiving and Richardson 105. There also became a point when Carroll realized the defense probably wasn’t going to win this one, either. If nothing else, they might have thought Watson would at some point falter the way so many young quarterbacks so often do at CenturyLink. Instead, he looked so much like Wilson did as a rookie in 2012, running and passing and willing his way to what could have been a breakthrough victory for a team that began the day in turmoil. But any doubt about Houston’s readiness was erased on the fifth play when Watson hit Will Fuller for a 59-yard touchdown, the first of 89 combined points that were the most at CenturyLink Field since Dallas beat Seattle 43-39 on a Monday night in 2004. But if Houston scored first, it was Seattle that scored last and ultimately the most. Words so sweet Sunday after just a few weeks ago when they might have seemed improbable.